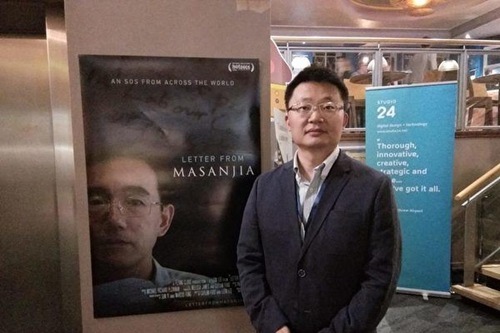 Letter from Masanjia, a documentary on the brutality against Falun Gong practitioners in Chinese labor camps, was recently screened during the Cambridge Film Festival on October 26 and 28, 2018. Leon Lee, director of the film, said that many audience members were moved to tears as they watched the film. Iris Ordorñez, an organiser of the festival, said that she selected Letter from Masanjia because she had always been keen on topics related to humanism, and in particular, this documentary relayed a strong message with powerful spiritual elements behind it. She said that the film was about ordinary people, whose actions may seem insignificant, but had a huge impact. She said she believed that it will inspire people to do good things that bring a positive influence to the society. She expressed hope that more people would watch the film and change the status quo in China. John Hodges, a retired neuroscience professor from Australia, said that he once worked at the Chinese Embassy in Sydney. Having seen Falun Gong practitioners protesting outside the embassy, he was glad to know more about the situation in China. He was aware of the suppression in China, but did not know that the torture was so severe and brutal. John Krich, a writer and journalist, said that the documentary helped him gain insight into Falun Gong, which had been vilified by the Chinese Communist Party. He said that the film described a strong spiritual belief, which earned his respect for Falun Gong practitioners. Philip Ward said that he was very impressed by the film. Sun Yi, the main character in Letter from Masanjia, will likely inspire people to testify against the damage caused by communism. “It is unlikely that the Communist Party will change,” said Ward. Although the labor camp system was ended, other means have been used by the regime to persecute people. David, another audience member, said that communism is a dangerous ideology. “It forced Chinese people to bow to its rule with violence and torture. Communism has failed in numerous countries, and it is an ideology that is not feasible,” he added. Leon Lee, director of Letter from Masanjia , stands next to a poster for the documentary during the Cambridge Film Festival. Lee attributed the positive feedback to Sun’s perseverance, something the audience could easily connect with. On the other hand, although what Julie, in the film, did may seem trivial, the effect was very good. He said he hoped that more people would learn about this and tell others. “Julie is an ordinary American citizen and that is what she did in the film.